The fabulous weather through the early and midsummer months prompted me to organise a weekend trip to Porth-Ysgaden, a calm, sheltered bay on the Llyn Peninsula south along the North Wales coast from Caernarfon. 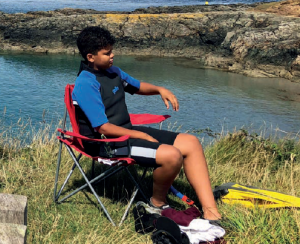 I have taken dive groups there for years, and have always been impressed by the marine life on display, but this time my focus was on the younger generation. For me, this weekend was going to be all about youngsters and teenagers and getting them in the water. The ages of those involved ranged from nine to 16, with my son Sam being the youngest and Shannon being the oldest – and terrified of water! Myself and Mike Minton coaxed her into the water very gently and took things step by step, and by the end of the weekend, she was racing the boys up and down the bay (NB: Since that weekend, she has done a try-dive in the pool and is now enrolled on her RAID Open Water 20m course!). The other younger element there were Jayden and Logan, and the latter is already in the process of notching up his Open Water 20m certification. I was so set on keeping this weekend kid-friendly, I didn’t even take any dive kit with me, but divers on the team for the weekend were Gail Nichols, Angus Andrews, Debra Smith, and Piotr and Agnes Dullek, while Pete Coby did a fine job of dive marshaling. 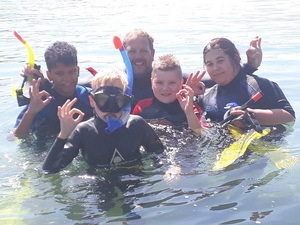 The weekend did not disappoint, and as well as fantastic weather topside, underwater we saw flatfish, blennies, wrasse, lobster, starfish, crabs and much more. Visibility was in excess of ten metres both days! I was born extremely premature and swimming from a young age had helped develop my lungs. I was very comfortable in the water, and my first-ever dive was in 2009, in a pool in Cyprus, when I was eight. The hotel we were staying in was offering trydives and my Grandad paid for me to have a go. It was fun and I took away underwater photos, a DVD and memories along with my PADI Bubblemaker award. Apparently the dive instructor said I took to it really well. I hounded my Mum to take me diving as she had dived a few times. When I got back into diving, I was 14. 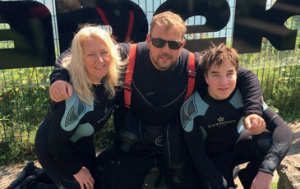 I initially qualified as a BSAC Ocean Diver in August 2016 at Capernwray with Kevin Murphy from Severntec Diving – I had just turned 15. Through Kevin, I moved over to RAID. I really enjoyed learning under the RAID system, as the course material is contained in comprehensive online booklets, to read at your leisure, and the theory is ten to 20 multiple choice questions. I went through the theory quickly. 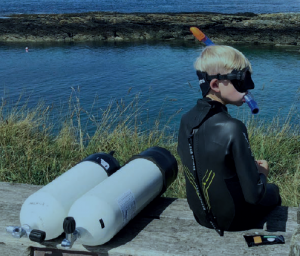 In the Open Water 20 theory, it even teaches you the basics of rebreathers, with an emphasis on safety and self rescue, learning how to avoid falling into the pit of cascading failures. I am now qualified as an Advanced 35 diver and also studied nitrox diving, drysuit diving, boat speciality and have done a basic first-aid course. I enjoy studying under Kevin because he is willing to answer any questions I have impartially. He is serious when he needs to be, but is always willing to have a good laugh. Last May, I had such a fantastic experience of a week on my first liveaboard boat, diving the Deep South of the Red Sea. I took part in Project Shark and experienced diving around my first wreck, the Salem Express. This, along with other UK dives at NDAC, was followed with a great weekend diving the Farne Islands with grey seals. I hope to soon become a Divemaster, and dive in many exotic locations around the world with our friendly gang. 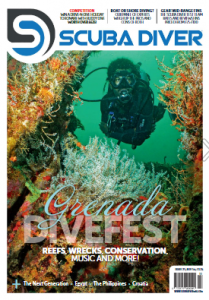 Our article in the November edition of Scuba Diver Magazine.